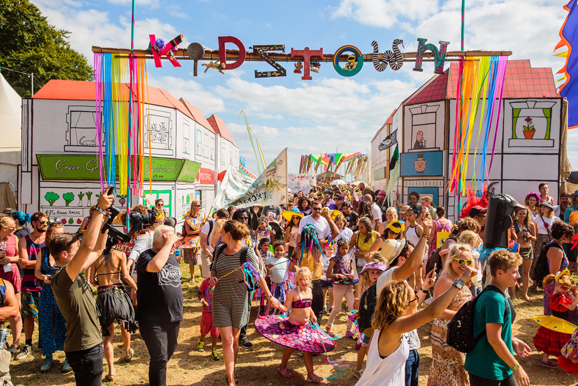 Looking to bring a small slice of the creativity, music and theatre of Boomtown to local charities, school children and families, Boomtown’s Kidztown and partners Bassline Circus, will be hosting a series of workshops in the Winchester area throughout July. Ranging from costume making for the women’s group at the Trinity Centre, to theatre workshops with the primary school children of Cheriton, along with the now annual family carnival arts workshops at the Discovery Centre and the music workshops held at Naomi House and Jacksplace, Boomtown are inviting people across the area to experience a small amount of the creative skills that go into making the international arts, music and theatre festival. CARNIVAL COSTUME: Design and make costumes for the Carnival parade at Boomtown on Sunday 13th August. THEATRE WORKSHOPS: Boomtown’s Theatrical team will provide an inspiring and exciting day of drama workshops. MUSIC WORKSHOPS: music production using live and electronic instruments with half of beatmaking duo Jus Now, who mix up cultures and blend sounds seamlessly. In addition to the free, open to all, workshops at the Discovery Centre, Boomtown’s Kidztown and theatre teams will also be taking the workshops to Cheriton Primary School on 7th July, hosting family theatrical and musical experience of the festival to young school children who live closest to the festival. For the first time Boomtown’s carnival creatives will also be hosting a costume making workshop for adults at The Trinity Centre with the women’s group on 5th July. Designer Abi Kennedy will be helping those involved create their masterpieces, which will later be worn at Boomtown’s Sunday carnival by children and other community groups. Simultaneously, on 5th July, Kidztown musical maestro Jus Now will be over at Naomi House & Jacksplace hosting their ever popular music workshops.